I filed one of this week’s three stories a few weeks ago, but it finally began making its way to the screens of readers yesterday. Starting a new column can be like that sometimes. I’d started writing this post in my head even as I was composing the prior week’s post for Discovery News on the same topic. This time around, I took a broader look at the regulatory and cultural background of the National Transportation Safety Board’s proposal to ban all non-emergency phone use by drivers (including an admission of my own past offenses). I hope it’s clear from the closing paragraphs that I’m not trying to beat up the NTSB here and agree that it has a point in wanting to discourage in-car phone use; I just don’t think that this is a problem that can effectively be solved with a new law. I’ve thought of writing an essay about this question for a while. I’m fascinated by the ways our analog culture adapts to digital advances, and in this case we haven’t come to any conclusion on how, exactly, we’re supposed to put a ribbon on a string of ones and zeroes–assuming we want to retain some of the traditional ritual of gift giving. Now that I’ve written that essay, though… meh. I feel like I didn’t quite pin down this topic. Writing a thumbsucker of an essay can be like that sometimes. My first tech-help column for USA Today’s site–what you could think of as the freelance rebirth of the Help File column and PostPoints Tip e-mails I wrote for my former employer–covers two perennial topics in any tech-support feature, Facebook and Android. 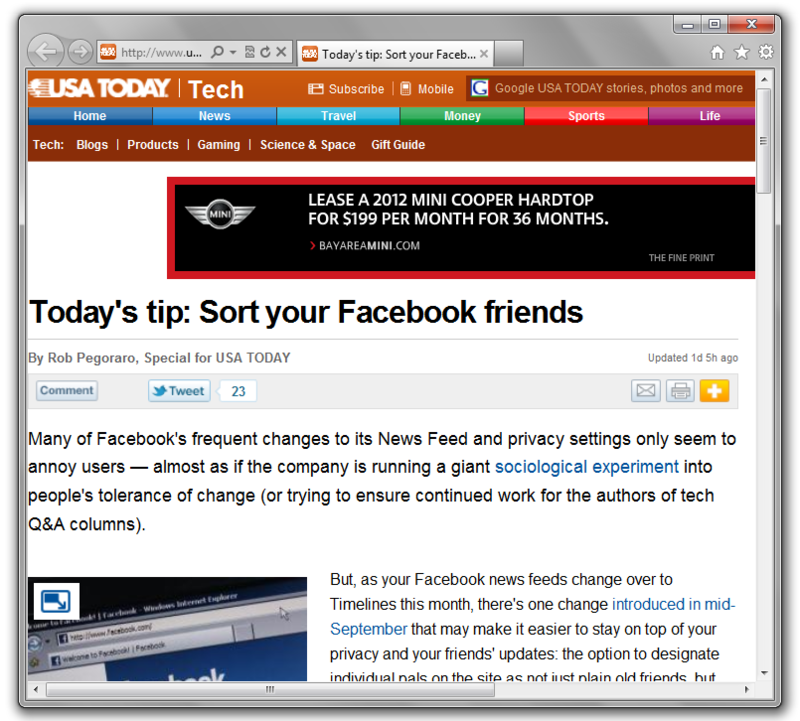 This week’s tip involves using the “Close Friends” and “Acquaintances” categories Facebook added a few months back to get a better grip on your privacy on the social network; the Q&A section revisits a longstanding weak point of Google’s mobile operating system, its lack of an easy, obvious music-sync option to iTunes. This entry was posted in Weekly output and tagged Facebook acquaintances, Facebook close friends, MP3 gift, NTSB phone ban, sync iTunes to Android, sync music to Android, virtual gifts by robpegoraro. Bookmark the permalink.